We kicked off our first morning of the Disney Social Media Moms Celebration (DSMMC) after check in by walking over to EPCOT. 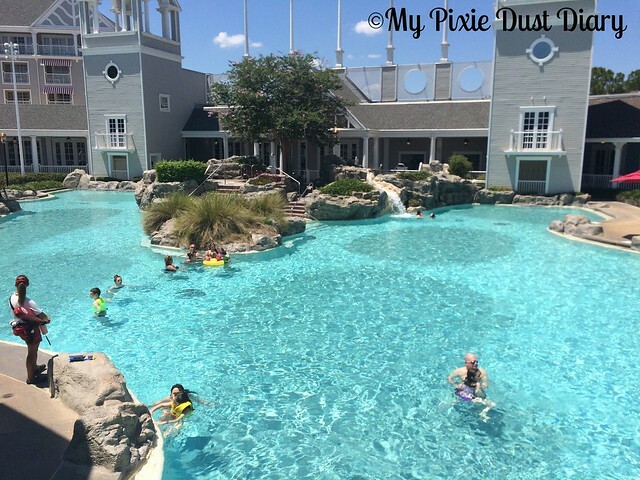 The Yacht Club and Beach Club are just a short walk from the park. If you’re not up for a walk, they do offer boat rides to both EPCOT and Disney’s Hollywood Studios. The boys wanted to head over to Soarin’ so we decided to check and see if the little princess was tall enough to ride yet. Sadly, she’s not quite tall enough yet but hopefully soon she’ll be able to take her first flight. 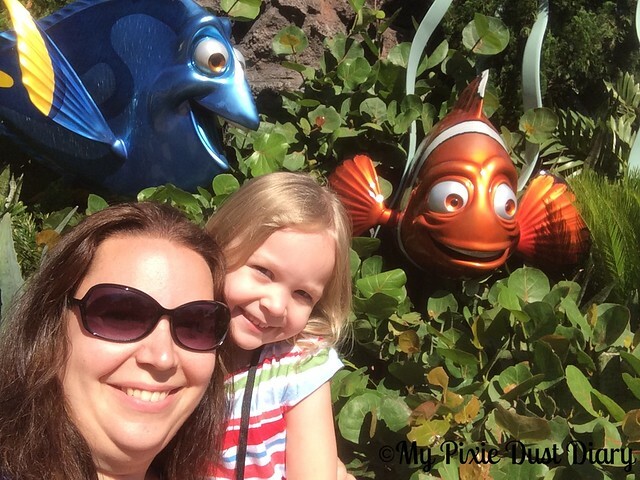 While the boys visited the rest of the country and said hi to Tink in Disneyland, we went on over to The Seas with Nemo and Friends to say hello to an old orange friend. 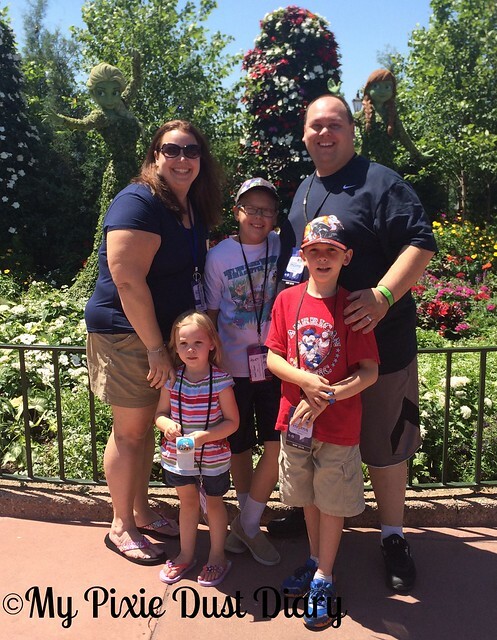 Before too long, we all met back up and the next “must do” was to check out Anna and Elsa during the International Flower and Garden Festival. The Photopass photographer swore our picture would get the most likes of anything I posted on Facebook so we had to put it to the test. After our fun in EPCOT, we had to head back to the resort. I had to get ready for our Welcome Reception and the family had to get ready for our dinner together. 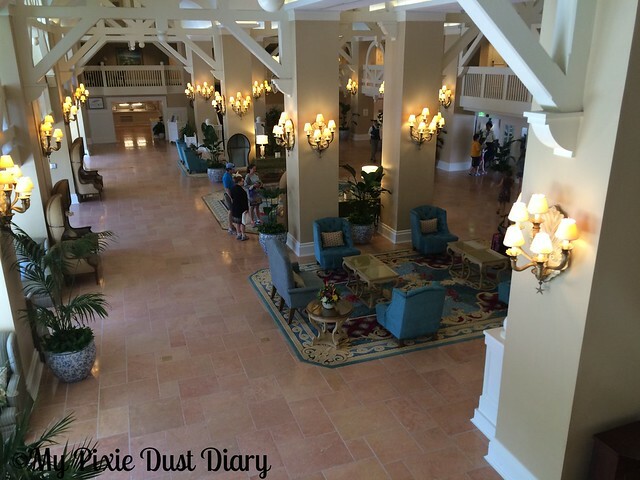 The lobby at the Beach Club was so beautiful and smelled amazing. Since the little one didn’t wind up taking a nap like we’d planned and we had a bit of time, the kids wanted to hit the pool. During check in, Cast Member Scott told Corbin all about the pool and how it was the biggest on property along with some other facts that Corbin had fun sharing during our visit. 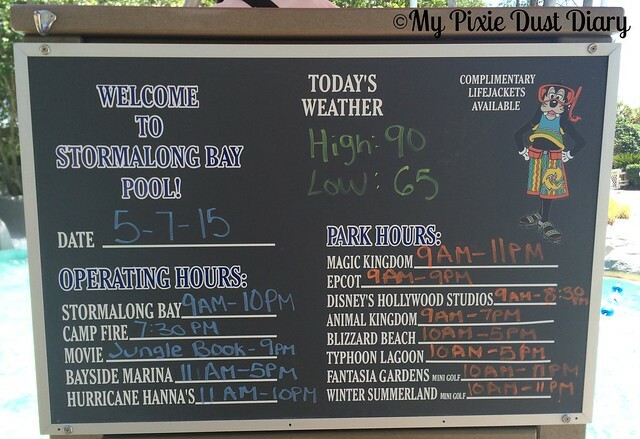 Scott was right – the pool was amazing! 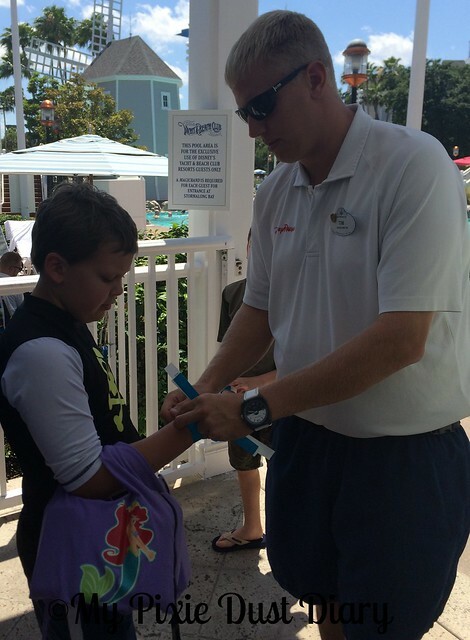 When visiting your resort pool, make sure everyone brings their Magic Bands! We got yelled at because we’d only grabbed one to get back in the room. I didn’t want to risk loosing any of them by bringing them since I didn’t think we needed them. Thankfully we were all able to go in after our talking to. 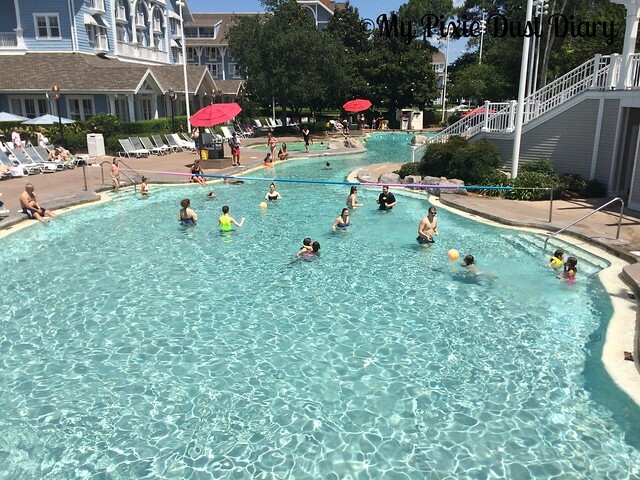 Despite being shared by both the Yacht and Beach Club resorts, the pool was plenty big enough for all the guests. It was hard for me to get around since I was staying dry and taking pictures because all the pools are connected so there are lots of bridges to get from one area to another. That also means shade is limited at the pool too. I had left my flip flops by the chair where we put our stuff but I had to go get them right away because the cement was so hot. The lazy river was a popular spot. 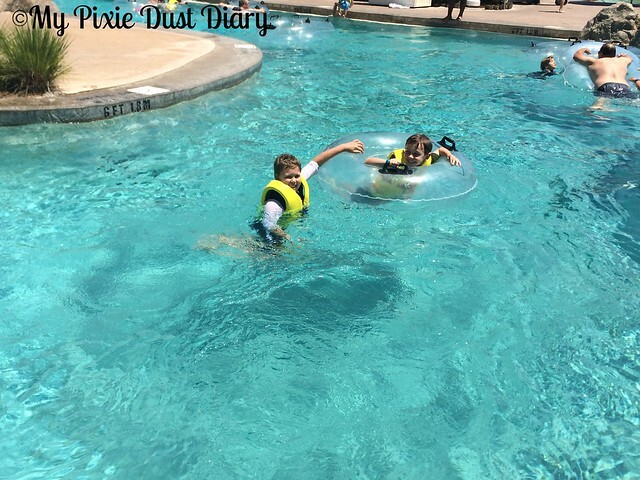 I made the boys put on life jackets in that area because it was deeper than other parts of the pool. Their dad was in the pool too, but better safe than sorry. 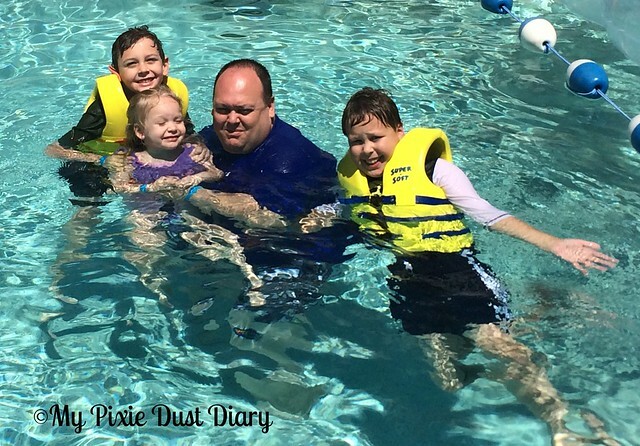 It seemed like the little people hung out at the sandy area of the pool. 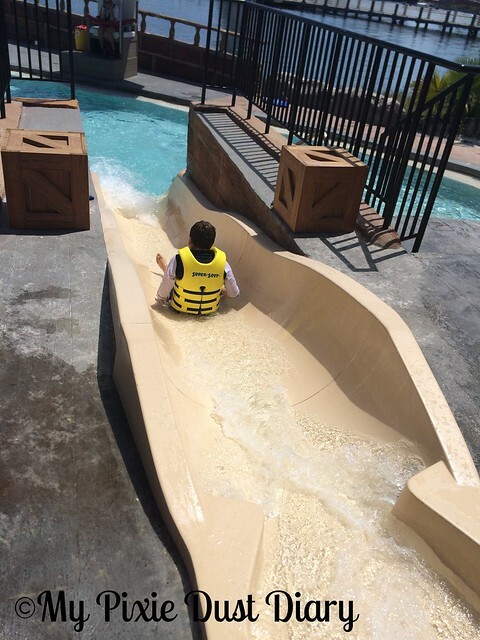 It was shallow and a bit quieter than other parts so it made sense for the little ones to be there hanging out with moms and dads. Like I said, lots of bridges to connect everything. They were hot just like the cement and got slippery from the wet kids in the pool so we all made sure to use the railings. I love seeing all the activities listed in a common area in case you missed the info in your room or forgot what time something was happening. To the left of the picture below you can see where the slide drops the kids into the pool. Just out of the picture to the left in one entrance to the pool (not the one we entered through). 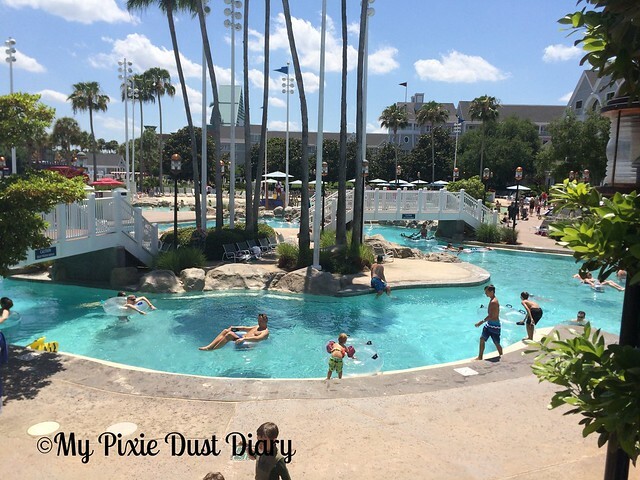 A short walk out of that exit across the sidewalk takes you to the shipwreck where the entrance to the big water slide is along with another small pool and water slide. Corbin tried out the smaller slide and tried to get Carolina to go on it but she didn’t want any part of it. We managed to get her down once but that was it. 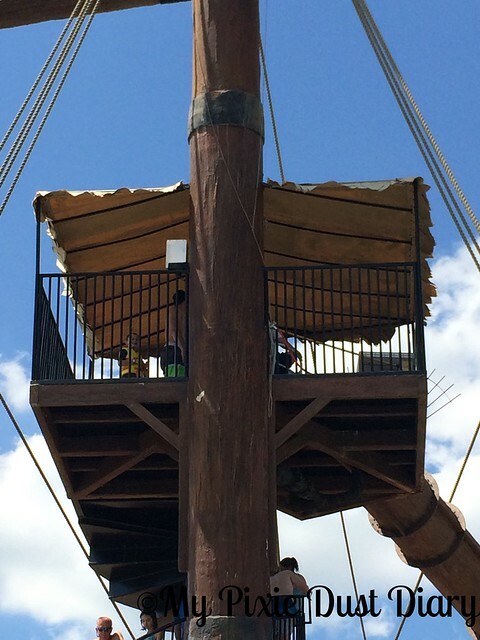 To get to the big water slide, riders have to climb some stairs to the mast of the ship. Then they splash out in the main pool and can go back across the sidewalk again. After the pool time, we had to head back to the room and get ready for the evening’s events. I was looking forward to mingling with some of the other moms and seeing what magic Disney had in store for the evening. Spoiler alert: there was lots of magic!